We were walking into a neighborhood coffee shop today when we noticed a very cool looking juice product. It was a Mango, Banana, and Orange Juice pouch. 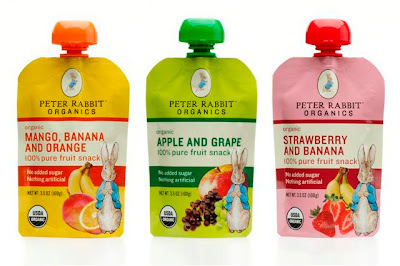 The name caught our attention right away...Peter Rabbit Organic Juice. We automatically remembered our Kindergarten teachers reading us the children's book with Peter as the main character. It made us want to try it right away. We picked it up and boom a great healthy taste. It wasn't packed with sugar. It was real fruit juice. Peter Rabbit Organics is a company out of the UK making its initia push into the US market. 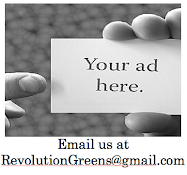 The juices are made using fresh, organic fruit with no added sugar, salt or artificial ingredients. They contain a full serving of fruit and are ideal for babies ready for solid food, as well as toddlers and elementary-aged kids. Kids will enjoy it straight from the pouch. Plus, choke-free caps make them safe for the little ones. The 3.5 oz. pouches will be available at select Whole Foods Markets and independent natural food stores in a number of regions across the country beginning this spring for $1.79 each. All three of their flavors will also be available on Amazon.com. 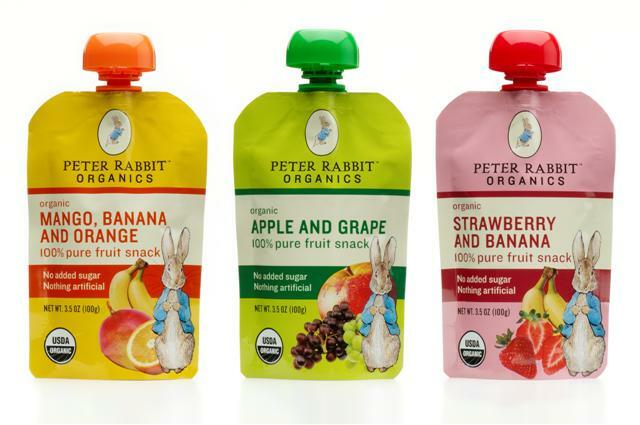 If you have a family or just want a great tasting pick me up that reminds you of easier times try some Peter Rabbit Organics.